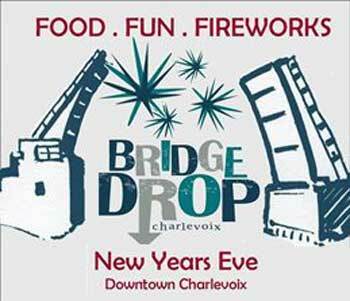 Celebrate the New Year in Charlevoix with the Bridge Drop. 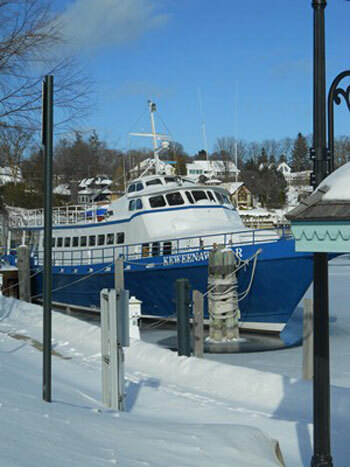 Visit downtown Charlevoix on New Year's Eve for food, fun, and fireworks! Celebrate the coming of the New Year in the biggest, brightest, and best way possible. Activities begin at noon in East Park with a snowman contest, s'more making and hot cocoa, arts and crafts at the Charlevoix Circle of Arts, horse wagon rides, and more. "Beauty and the Beast" will be shown for free at the Charlevoix Cinema and following the movie, the Tommy Tropic Show will take place in East Park 30 minutes before the 9pm and midnight fireworks. Before fireworks and the bridge drop, restaurants throughout downtown Charlevoix will have live entertainment and specials on food and drink. Two separate fire works displays take place overlooking frozen Round Lake.